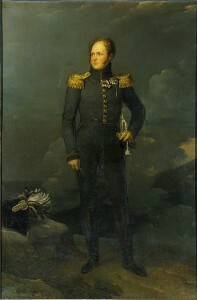 Alexander I, was the head of the Russian state when it was invaded by Napoleon. His patient leadership during the invasion and Alexander’s change from leading the army himself to relying on his more experienced generals was key to winning the war. Since I recently blogged on Alexander, instead of rehashing his life, you can read about it here. 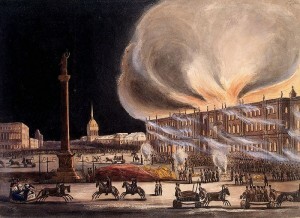 On December 17, 1837, the Winter Palace caught on fire. The official home of the Tsar’s of Russia, it was first built starting in 1711 commissioned by Tsar Peter the Great. The first Winter Palace was designed by Domenico Trezzini, a Swiss-Italian architect. Trezzini’s most famous work that still stands today is the Peter and Paul Cathedral. Peter I, as he was want to be, soon grew tired of the building and commissioned a second one to be built. This time he switched architects to Georg Mattarnovy. It was in this version of the Winter Palace that Peter was to die in 1725. Peter II, decided in 1727 to redo the building his grandfather had begun. This time he brought back Trezzini who decided to make it a far grander palace. The third version of the Winter Palace was completed in 1728 but Peter decided to move the court to Moscow. 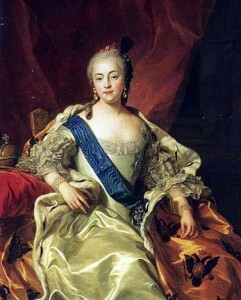 With his death in 1730, Anna I decided to move the court back to St. Petersburg. She wanted a more grandiose palace so she called in Francesco Bartolomeo Rastrelli to make it so. It was under Elizabeth I that the palace really took shape. At a cost of over 2.5 million rubles, it was truly spectacular. 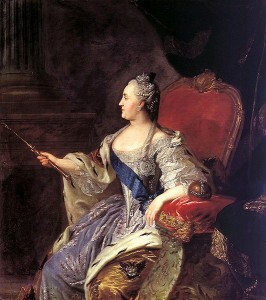 But under Catherine the Great, things really became extravagant. Incredible art pieces were installed throughout. The Hermitage was built adjacent to the Winter Palace by Catherine in 1764 to hold the overflow of art. More art poured into the Winter Palace after taking many masterpieces from Napoleon’s ex-wife Josephine. Alexander I and Nicholas I continued to upgrade things with the latter being responsible for the rebuilding after the fire in 1837. It now contains 1,500 rooms, 1,786 doors and 1,945 windows which is staggering to say the least. Because of its size, after the assassination of Alexander II, it was deemed to be too big to protect the last two Tsar’s. The the Palace of Gatchina was now the primary home, some 40 miles from St. Petersburg. Nicholas II decided that this didn’t suit him and his family and moved them to Tsarskoe Selo. Under Soviet and current rule, the Winter Palace is part of the overall Hermitage museum. It attracts over 3.5 million visitors each year. It is a marker for the decadence of the Russian Tsar’s and a monument to incredible art. Hopefully, in the not to distant future I will be able to visit the Winter Palace which I understand was not very far from where my ancestors lived. On December 4, 1878, Mikhail Alexanderovich Romanov, the last Tsar of Russia was born. He was the youngest son of Tsar Alexander III and brother of Tsar Nicholas II. He was the first, but not the last, Romanov to be murdered by the Bolsheviks. Born into royalty, when he was born he was fifth in line to the Romanov dynasty. When his grandfather Tsar Alexander II was assassinated in 1881, he moved up to fourth. 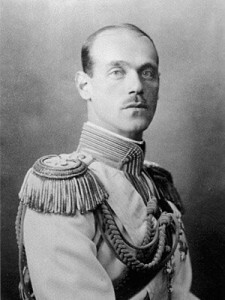 With the death of his father Tsar Alexander III in 1994 and the ascension of his brother Tsar Nicholas II, he became second in line behind his brother George. George died in an motorcycle accident in 1899 which made Mikhail the next in line. When Nicholas’s son Alexei was born, he was no longer next but because of the boys delicate health, having hemophilia, he was regarded as the likely heir should anything happen to his brother. While most would think that being born into a family as wealthy as the Romanov’s would mean a life of luxury, it was not so with Mikhail and his siblings. Tsar Alexander III believed that the children should live a spartan life, sleeping on hard beds, and washing themselves in cold water. Still, life for them was far better than the majority of Russians of the time. Life changed dramatically for Mikhail as his father died when he was just 15 years of age. He was quickly enrolled in military school to prepare him for the potential to take over as Tsar should it come to that. His love life began in controversy as he fell in love with his first cousin, Princess Beatrice of Saxe-Coburg and Gotha. Their proposed marriage was denied by both the Russian Orthodox Church as well as his brother, Tsar Nicholas II. He reluctantly ended the relationship. Next up was a relationship that horrified the Tsar’s family as Mikhail fell in love with a commoner, Alexandra Kossikovskaya. Dina as she was known was never accepted by the family as they had her followed constantly by the Russian secret Police, the Okhrana. Eventually, he met someone Natalia Sergeyevna Wulfert, the wife of a fellow military officer. The Tsar’s family was once again aghast at Mikhail. Eventually she would divorce her husband to marry Mikhail but much to the chagrin of his family, she gave birth to a boy George, before the divorce was finalized. The Romanov’s back dated the divorce to avoid further embarrassment. 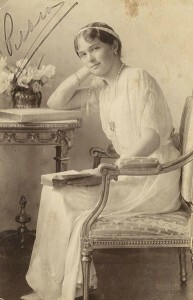 When World War I began, Mikhail asked to return to Russia with his wife and child to help with the war effort. He served bravely in the war but he felt that it was a tragedy for the people. With the war going so poorly for the Russians, he was further dismayed when his brother Tsar Nicholas II decided to take over as Supreme Commander. 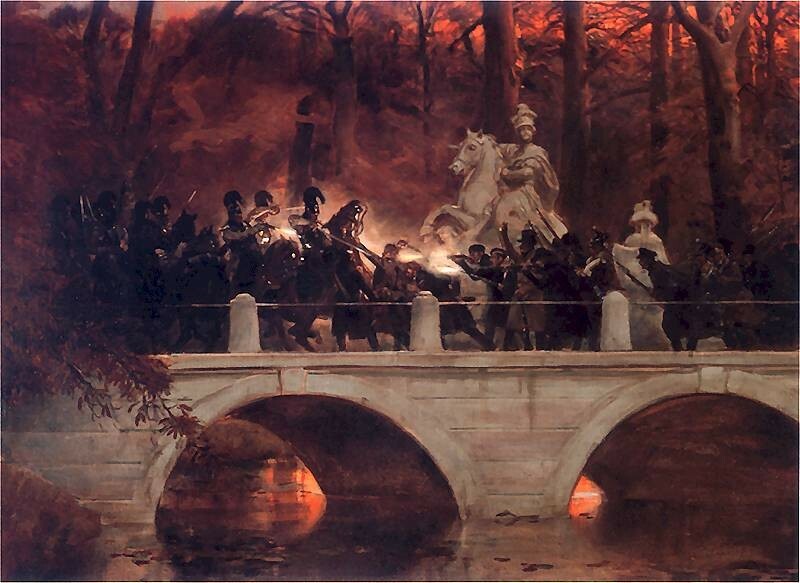 His countless mistakes caused great suffering and terrible casualties among the brave Russian soldiers. Mikhail was not told of the decree until the next morning. After careful deliberation and pressure from the Provisional Government, Mikhail conditionally declined the offer, effectively ending the Romanov Dynasty. Nicholas was very disappointed but had little choice in the matter. On August 21, 1917, Mikhail was put under house arrest and while later released, the Bolsheviks, now in power, rearrested him. On June 13, 1918, Mikhail Alexanderovich Romanov, would become the first of the royal family to be murdered. It was an ignominious death of a man so close to the pinnacle of power as the presumptive last Tsar of Russia.